Professors Celia de Anca and Salvador Aragón examine how collaboration has become one of the watchwords of the digital age, and how co-creation, co-sharing, co-working, co-design, and co-thinking are now key elements in a new form of economic activity. This is commonly referred to as the collaborative economy, with people increasingly organizing their lives on a collective basis, mixing their private and professional existences, and operating in small groups akin to traditional clans that can just as easily function on a neighborhood basis or at the other end of the world, as though the global and local were just one continuum. This collective mind-set has changed our traditional understanding of diversity, expanding into new cultural identities in which, in addition to identities of origin, new, aspirational ones emerge. Anca and Aragón call this “tribal behavior” and look at how it can be channelled into economic activity, integrating it in the process into systems to successfully explore and exploit new business scenarios, as well as developing new business models. Introduction: Is the Age of Individualism Over? At the end of the 1980s, sociologist Michel Maffesoli1 used the term “tribe” to illustrate a significant shift in society underway since the European Enlightenment, from one built around the individual to a world populated by “affective communities.” More than two decades on, the collective energy the French thinker saw emerging is now developing at full speed, helped by new information technology systems. The myriad of existing global networks enables the simultaneous participation of individuals in a multitude of groups that they come to identify with. Diversity in identity today goes beyond identities of origin to include additional identities that can be channeled via a multitude of cultural communities or tribes that individuals aspire to belong and contribute to. The new form of collaboration is based on difference, not sameness. Old tribes were built on sameness, and were thus closed to others to protect their individual members, which usually led to confrontation and isolation. By contrast, the new tribes put individual differences at the service of collaboration, and are open to others and interlinked with other tribes in a multiplicity of networks that enable individuals to work together. Shared action is the driving force behind collaborative economics. According to Von Mises (1949)2 the central issue in traditional economies is human action as an nindividualistic application of human reason to select the best means of satisfying individual ends. In a complementary way, the collaborative economy could be defined as the collaborative application of human reason to select the best means of satisfying the collective ends of the group. Two complementary factors define collaborative economics: the collaborative nature of needs (ends) and means. To qualify as collaborative, an activity must satisfy a shared need within a group. For example, car sharing is a response to a shared need for transportation. In addition, the sharing economy implies a shared use of need-oriented means within the group in order to satisfy a previous need. A clear example today of this is online crowdfunding: platforms used by lenders and those starting up a business or project to satisfy investment and funding needs. This chapter will be divided into two main areas: the first will analyze diversity and the new forms of tribalism emerging in society; the second will deal with how tribes can be understood in the context of the collaborative economy, describing a few examples of how this tribal intelligence can help organizations to exploit and explore new business scenarios and new business models, as well as how to define a flexible structure in which multiple tribes can operate for the common good. To paraphrase Hannah Arendt, the contributions made by one’s difference can only occur within a group of equals. Within hierarchies and under dominance, we tend to repress our differences to avoid punishment. Because of this defense mechanism, certain identities of origin have traditionally been suppressed in order to conform to the majority: sexual orientation, accent, behavior, etc. The unease created by repressing our identities of origin creates barriers for individuals to reach their aspirational identities. Identities of origin are those already incorporated within the person (being a man, Vietnamese, and so on), whereas aspirational identities are chosen and driven by affinity of interest (for example, belonging to the techno geek or environmentalist tribes, or in the case of migrants, being perceived as a member of the country of destination with all the rights that entails). The word “identity” comes from the Latin meaning entity. Therefore it is the movement of becoming identical to some entity, implying a process. This process can have two directions: I might decide consciously or unconsciously that I belong to a certain group, and thus identify with it, meaning that I follow certain patterns of behavior to conform to the group; equally, the process can be outside of me because “they” (those in the outside world) have decided to categorize me within a certain group, which implies a certain pattern of behavior that people expect me to conform to accordingly, but which nevertheless I may or may not identify with. Therefore, it is commonly assumed that there are two distinct processes of identification: one is self-identification, or group identification, which is the process through which an individual decides to identify with a certain group; and the second is that of categorization, when the process is external to the individual and he or she has no choice in the matter. Identities of origin tend to have a strong component of categorization and thus of the projection onto a given individual of the qualities assumed to be part of his/her group, as for example in the case of prejudices against a particular race or religion. These barriers exist in the community outside the individual who faces them (and also outside his or her group of affiliation). By contrast, aspirational identities have a strong identification component. Social identity, and in particular group identification, has been widely studied in management literature, pioneered by Tajfel4. Social identification appears to derive from the concept of group identification 5 and could be defined as “the perception of oneness with, or belongingness to, some human aggregate”.6 This led Turner7 to propose the existence of a “psychological group,” which he defined as “a collection of people who share the same social identification or define themselves in terms of the same social category membership.” A member of a psychological group does not need to interact with, or like other members of the group, or be liked and accepted by them. The individual seems to reify or credit the group with a psychological reality apart from his or her relationships with its members. If the outside world rejects one of our identities we tend to defend it or feel ashamed by it, but in any case that particular identity takes on a much bigger role in our multiple being than it would otherwise. If our different identities are accepted with normality—that is to say, if we can operate in a context based on equality—our regular being is fluid and highly adaptable to the external environment and to the different affiliations that can freely be sought. Managing multiple identities represents a model better adapted to the fluid and changing realities that characterize today’s global society. The inclusion policies of recent decades have enhanced the participation of individuals in identities outside their identities of origin. This increased acceptance of world diversity, together with important changes in ICT systems, consolidates an emerging collective paradigm of groups made up of individuals who want to belong. The microgroups that dominate the landscape described by Maffesoli are not residuals of former traditional social life, but the key social fact of our experience in everyday living. These new organizations represent a new way of living everyday life based on a communal, as opposed to an individual basis. These new communal identifications define roles that people play (as in a play having a role in it), but are not a permanent form of association. According to Bauman,8 these new communities cannot play the traditional role of a community, since liquidity and a changing nature are their main characteristics. Providing shelter and protection from individual misfortunes is not one of the characteristics of these new forms of collectivity. Instead, they represent a temporary place within which to act. Bauman proposes that the durable identities once associated with work have given way to looser and more provisional identities and conceptions of community that are subject to constant change and renegotiation. He defines this set of provisional and always-traded identities as liquid identity. These communities of the network society appear as a result of the emerging forms of relationships enabled by new information and communication technologies. According to Castells9, networks allow a new kind of social relationship characterized by collective behavior, rather than a collective sense of belonging. Networks are neutral and do not have personal feelings—it is what people do in the networks that can lead to certain social processes. In Castells’ analysis, the power of identity within the new e-networks becomes the key driving force for identities whose source lies in legitimizing identities, which are provided by institutions such as the state, political parties, unions, the Church, or the patriarchal state, but which have lost their cohesive capa-city, leading to the appearance of resistance identities, which are imposed from above and built around traditional values such as God, nation, and family, or can be built around proactive social movements like feminism or environmentalism. Finally, we see the emergence of project identities, whereby individuals link their personal projects together with others for a common good. The collective energy of a new paradigm—whether labeled project identities, aspirational identities, or liquid identities—represents a form of temporary engagement to a group that is bound together for a common interest, and that uses the differences between its members to collaborate, co-create, or execute other kinds of joint action within a collaborative eco-nomy. This individual difference, freely given to the service of a given group, illustrates the main characteristic of the new emerging tribes. The term “tribe” is troubling to the modern mind, suggesting a return to collective restrictions on our individual freedoms. But the tribalism emerging in this new paradigm of a collaborative economy is a sign of modernity, not of regression to darker times; the new emerging tribes enhance our individual freedoms, fostering individual contributions. What both old and new tribes share is that their members identify emotionally with the group, as well as sharing mutual interests and organizing different aspects of their personal and professional lives jointly with the goal of fulfilling a common objective that is good for the community. Traditional tribes were closed entities with high entry and exit barriers to protect their members from any negative influence. By contrast, new tribes are open. People can join and leave easily; there is a high degree of mobility and a continual renewal of ideas and influences. In the past, due to poor communication, tribes had little contact with each other. This preserved their uniqueness. Thanks to technology, members of the new tribes belong simultaneously to many others. This creates multiple links among them as part of a super tribal global structure that allows individual participation within a comfortable small group, while at the same time providing exposure to a multiplicity of different groups. Traditional tribes were hierarchical, and obedience to the leader was the first requirement of membership. Members of the new tribes create rules and strategies collectively. They resemble flocks of birds, in that while they appear to be following a single leader, they actually follow different leaders, given that different individuals have different abilities, resources, and strengths that allow them to lead in certain stages, but not necessarily throughout the whole process. Old tribes were based on a pattern of continual confrontation against external tribes. In today’s tribes, no one is sure who is external and who is internal, since membership interconnection makes it difficult to identify who belongs to what. Collaboration is thus a logical strategy between different tribes. Membership of old tribes usually lasted a lifetime and, often, beyond that, passing from one generation to the next. Only a cataclysm or an invasion could put an end to membership or the tribe. New tribes, by contrast, are short-lived; they emerge and disappear when the task at hand is complete. Belonging to old tribes was dictated by birth, on the basis of family, color, gender, or class. In new tribes individuals can contribute by choice using their multiple identities. Perhaps the most salient feature differentiating the old tribes from the new ones is that old tribes were formed on the basis of sameness, while new tribes are formed out of differences bound together by a common interest. Sameness is what makes us equal, by biological composition. We share our sameness, our fear, hunger, pain or pleasure. Sameness helps us to ensure the satisfaction of our individual needs, which might be the same as somebody else’s: this sameness can unite us in pursuing a common fight. Commonality is something we can all feel part of, but it is not owned by anyone in particular. Our contribution to the common good is dictated by our individual differences, and does not help any other member in particular; it simply benefits the whole community, directly or indirectly. Sameness can make us work in confrontation because we need to defend ourselves from the rest. By contrast, contributing to the common good is a voluntary activity, since we do not really need to, meaning we can be open to collaborate with other tribes, co-create, and be open to external influences, staying or leaving as we wish. New tribes exist only for a purpose, and when their purpose is finished or no longer satisfying, we can leave. They do not provide us with a permanent shelter to guarantee our survival, and are instead a temporary space within which to act with other individuals who share our common interest. These groups are not created for fun, although they can be fun. Individuals join in to act, and for that purpose the group will appreciate the different perspectives that can help achieve specific goals. A well-established solution to this is the ambidextrous organization. According to Duncan,12 an ambidextrous organization is able to combine exploitation of existing capabilities with exploring emerging opportunities. As a result, a company can be creative and adaptable. In simple terms, dynamic capabilities could be used to create or discover an entirely new business model, or to expand, extend, or modify an existing one. According to Osterwalder15 a business model is defined as a description of how an organization creates, delivers, and captures value. This is devoted to increasing the performance of an existing business model. The organizational focus is exploitation, and dynamics capabilities are devoted to business model modification without any substantial alteration. In this case, a better exploitation of the model implies substantial changes in the existing business model. The development of new dynamic capabilities is needed. Without any substantial modification of the business model, the organization is focused on exploring new markets or products when the existing business model could grow, leveraged by its current capabilities. In this case, an entirely new business model appears as a result of the exploration of new opportunities in the market, technology, or any other environmental factor. 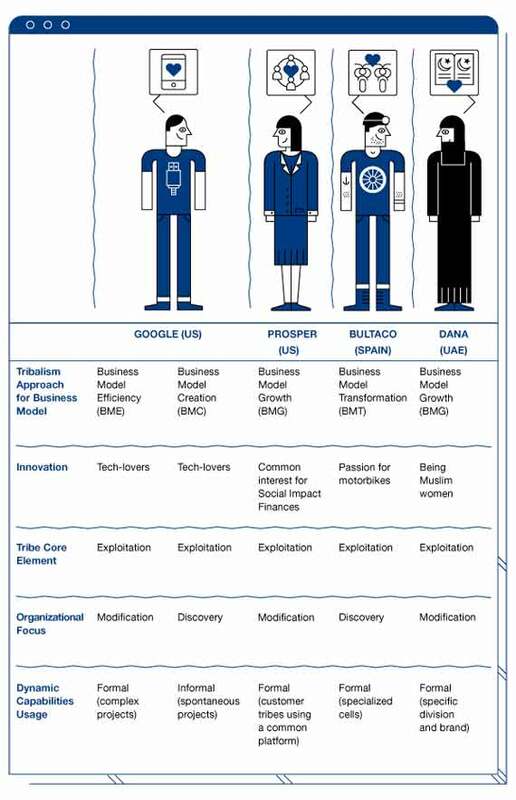 Some companies are able to take advantage of the multiplicity of tribes in a wide variety of contexts, either as a tool for exploitation or as a way to develop dynamic capabilities for the business model’s modification of discovery. When organizations are not able to understand and use this form of social aggregate, opportunities for collaboration within different internal (inner) tribes or customers are lost. The “plurality” in the use of the tribal paradigm in organizations is well illustrated in the proposed cases. Three of the proposed approaches are represented. An additional insight is highlighted in Google’s case: multiple approaches to tribalism can coexist within the same organization. The organizational use of tribes is well documented in the technology industries as a way of tackling the exploration dilemma. The most common approach is the use of the so-called “geek tribe.” A geek tribe is made up of highly skilled technology experts who focus on a relatively narrow field. The geek tribe is easily recognizable by being located in a specific space (often christened the lab) when the group talent is devoted to solving a concrete technological challenge. This kind of tribe is characterized as being highly meritocratic and goal oriented. In the case of Google, the common element that glued the geek tribe together was technical expertise focused on exploiting new opportunities. The basic material of Google is made up of a swarm of small teams focused on solving a narrow problem for a very short period of time. The team can be disbanded once the task is finished, or if a more urgent one appears. Let’s imagine a geek tribe made up of six members trying to improve some feature of Google’s Chrome browser. The tribe’s main objective is to further exploit a well-defined business opportunity by solving a technical challenge related to the browser. Once the problem is solved, a new task could be assigned, or the tribe disbanded, with each member reassigned to another team where his or her personal technical expertise could be used. This usage of tribes could be seen as a Business Model Efficiency (BME) approach. But Google’s use of tribes is not only limited to business exploitation, and a certain amount of exploration is encouraged. According to the famous 70/20/10 model, each member of the tribe should utilize its time according to the following ratio: 70% should be dedicated to core business tasks; 20% to projects related to the core business; and 10% to projects unrelated to the core business. This remaining 10% of time can be used by a smart employee to explore a new technology with no relation to the current business. Eventually, this technology could lead to a new business opportunity. Furthermore, using an internal board system, collaboration with other employees could be requested and managed. In this case, tribes are used as a tool for exploring future opportunities, thus providing an excellent example of the Business Model Creation approach. Multiplicity of tribes appears in formal and informal ways. The most common formal way is in the form of complex projects. A project is developed and directly encouraged by the company, and its task is fulfilled by several small teams in the form of a geek tribe. Because most of those teams are short-lived, in a standard project each employee could have been a member of several tribes across the project’s lifetime. The most common informal approach is related to spontaneous projects that emerged from the 10% slot of time involving some highly interested and motivated employees exploring a new opportunity which, if it shows potential, can be adopted by the company and assigned to a formal team. In the case of Dana, the core elements around which the community emerged was clear: Muslim women who were interested in specific financial products to serve their particular needs. In this case, the dynamic capabilities development is focused on an existing business model, while the organizational focus is on exploring a kind of specific customer (women). As a result, a Business Model Growth (BMG) approach has been implemented. In the case of Dana, the core element around which the community emerged was clear: being a Muslim and a woman. This led to a product that could be used for their community. However, the core element around a tribe is not always that clear. Sometimes the core element is a passion around an idea. In these cases of identities of aspiration, companies cannot organize the taskforce around the core element of the tribe, since this is not explicit. What they can do instead is to create a context of possibility within which those tribes can emerge and then monitor the emergent tribes and react quickly to their needs. The following example of Prosper is a good illustration of how a company creates a context of possibility. Prosper is a pioneer in the field of peer-to-peer lending, whereby individuals are able to lend money to other individuals, thus avoiding traditional financial intermediaries. This kind of financial intermediation known as P2P (peer-to-peer) lending was one of the first examples of the collaborative economy. Prosper represents another example that excels in the exploitation role led by customer tribes. In the case of Prosper, the customer tribe is made up of customers who have been able to identify a business opportunity and create a business model to exploit it within an existing community-based model led by a company. The core element of the tribe in this case is a common interest in having an investment that in addition to providing them with revenues, does have an impact on a given community. In terms of our definition of a collaborative economy, we found a set of tribes that shared a collaborative need (a business opportunity), and a collaborative means (Prosper’s technological platform). Prosper is able to create a specific context for each affinity group. Quite a common kind of group is comprised of former students of a university (an alumni group) that has decided to invest in current students by providing them with money to pay for tuition fees. This group of investors is held together by three complementary factors: the sense of belonging to the university; a common investment goal; and possessing very specific knowledge about the students’ employability, which is extremely useful as a risk indicator. Another customer tribe could be dubbed a neighborhood tribe. Residents of one district decide to invest as a group in a community in a neighboring district that needs to finance its mortgages. Taking advantage of local know-ledge to assess real estate prices, neighborhood demographic changes, and even the presence of welcome or unwelcome new residents in a specific street, this investor tribe can generate a tremendous improvement in investment quality. In addition, investment-related information could include non-traditional sources such as neighborhood gossip. Based on Prosper’s experience, customer tribes can appear around a clear customer need that is not being properly fulfilled. Despite Prosper offering basic information and mechanisms for credit scoring on borrowers, some kinds of borrowers could be assessed more precisely by using additional information and specific risk metrics. It is this kind of improvement where investor tribes appear within the Prosper ecosystem. In this case tribes are supporting a Business Model Growth (BMG) approach. In this case, the multiplicity of tribes is empowered by the design of the Prosper online platform. Although the common interest can be defined as shared interest social-impact financing, each financial tribe uses the Prosper website as a common channel to access would-be borrowers, as well as a promotional tool to attract them. Instead of defining different core elements for each specific tribe of customers, Prosper creates open contexts in which each customer tribe emerges naturally, and it is only in a second stage that the company can define the core elements of each tribe. Within this open platform, some customers grouped themselves around niche investment opportunities, creating a rich environment of tribes of investors with very different interests and goals. In addition, Prosper’s website attaches great weight to creating and managing investors’ groups, in the process providing a basic mechanism for the internal management of the tribe, including control over membership. If organizations want to harness tribal power, new forms of management styles are required. A good illustration of this is the one implemented by a Spanish start-up that was created four years ago by two engineers who got together a group of product managers passionate about motorbikes, creating a project out of that passion. So passionate were these managers that they took it personally upon themselves to write a business plan and search for potential investors. Once the project was underway, they decided that the company would need to be completely digitalized, which required a comprehensive, fully integrated information system for the entire company. The information system required to support an up-to-date management model had to be flexible, robust, and potent, requiring a new approach, so that it would be able to accommodate the new social model being implemented. For this reason, it was clear that traditionally hierarchical schemas would not work, given their inflexibility and the limitations they imposed on decision-making and response times. Therefore, the team opted for a model based on specialized cells able to work together on a common goal. Once this was completed they would then join up to tackle a different task as required, showing their ability to respond to random events. A model of this kind requires independent decision modules coordinated to meet specific needs, able to recombine themselves in different ways. Each cell could be defined as a specific decision-making-oriented tribe. To represent the structure graphically would require 3D diagrams incorporating mobility, making its representation, conceptualization, and understanding extraordinarily difficult. For this reason, and after thorough analysis, we have opted for a two-dimensional “Wheel Model,” based on the principles outlined below. All companies have a series of scopes—a combination of decision-making spaces oriented to a specific managerial task—that are essential for the proper functioning of the whole. However, these scopes have to adapt to the needs of the company, and depending on the situation can be broken up into fragments, grouped, or disbanded, or give rise to new ones. The scopes need to perform functions and tasks, or particular processes, which directly or indirectly involve others with varying intensity depending on the task at hand, and the temporality and opportunity it possesses. In addition, the scopes, in the development of their functions and/or processes, consume the resources of other scopes and/or generate resources for other scopes. All this comes about through a dynamic process, simultaneously, responding to situations that are not specifically pre-programmed: the inputs set by the evolution of the market must be counteracted. 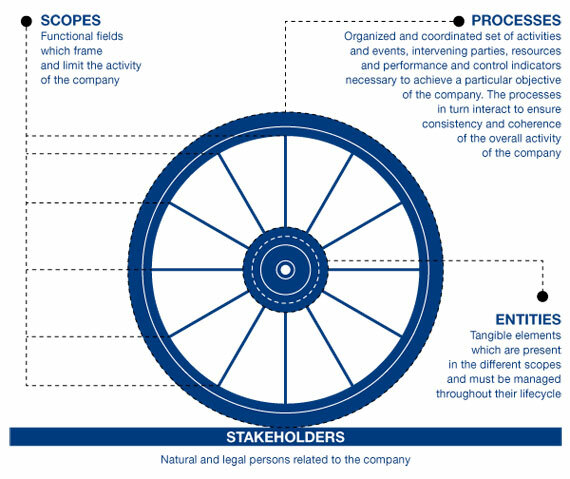 A graphical representation of this could be a wagon wheel, where the spokes constitute the scopes: functional areas, departments, working groups, etc. that develop the company’s activity. As such the wheel is formed by the processes (the rim): the organized and coordinated set of activities that involve as many scopes as necessary. It is represented in a circular fashion, because each scope interacts with the others, either to obtain information or, on the basis of this information, to develop new scopes that could be added to the hub and are accessible from another scope. The shaft will be formed by the entities or resources available to be used from each scope. The wheel will be driven by the stakeholders: groups or individuals the company has some type of relationship with, or who have some kind of interest (stake) in the project. 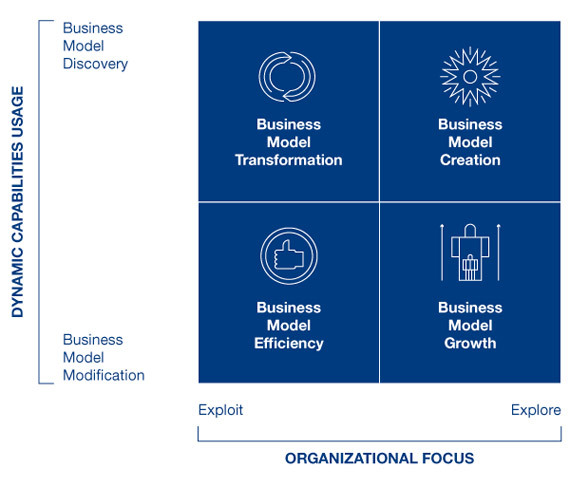 The Bultaco case illustrates Business Model Transformation (BMT), whereby organizational focus is about meeting the challenge of exploiting a highly sophisticated business model, while trying to discover new competitive capabilities to allow the firm to compete under very volatile conditions. The nature of the collaborative action is based on the presence of a collaborative end (to develop a business based on a passion for motorbikes), and a collaborative means (organizational cells) that have enabled the creation of a very distinctive business model. We believe that tribal thinking today embraces community without renouncing universality. The paradigm change we are witnessing is a shift from a longing for independence in a society made up of communities to a longing for belonging to a society made up of individuals. Both individuality and community have value in the new tribal understanding. Individuality comes via one’s background, perceptions, and ideas; in other words, everything that make us different. This difference is made valuable in a community that has gathered to accomplish a specific purpose which has a meaning for its members. The new mindset of a collaborative economy based on groups sharing a common culture requires an equal playing field on which differences are valued rather than rejected, as well as a strong common interest that motivates members, along with contexts of possibility within which the magic of creation can occur. Organizations cannot force motivation upon individuals, nor engineer creativity. But what organizations can and should do to capture collective energy is to create contexts of possibility. This is an opportunity (the collective energy of the new tribes ) to spark new ways of innovation generation within the organization, allowing the modification or even creation of new business models, as well as enabling mechanisms for a better exploitation of current businesses, as well as the exploration of new products, markets, and technologies. M. Maffesoli, Le temps des tribus: le déclin de l’individualisme dans les sociétés de masse (Paris: Méridiens Klincksieck, 1988). L. von Mises, Human Action: A Treatise on Economics (New Haven: Yale University Press, 1949). H. Arendt, The Human Condition (Chicago: University of Chicago Press, 1958; repr. 1998), 178. H. Tajfel, “La catégorisation sociale,” in Introduction à la psychologie sociale, ed. by S. Moscovici, 2 vols (Paris: Larousse, 1972-3), I (1972). E.C. Tolman, “Identification and the Post-war world,” Journal of Abnormal and Social Psychology, 38 (1943), 141-48. B.E. Ashforth and F. Mael, “Social Identity Theory and the Organization,” Academy of Management Review, 14.1 (1989), 20-39. J.C. Turner, “Social Identification and Psychological Group Formation,” in The Social Dimension: European Developments in Social Psychology, ed. by H. Tajfel, 2 vols (Cambridge: Cambridge University Press, 1984), II, 518-538. Z. Bauman, Community: Seeking Safety in an Insecure World (Cambridge: Polity Press, 2001; repr. 2008). M. Castells, The Information Age: Economy, Society and Culture, 3 vols (Cambridge, Mass. and Oxford: Blackwell, 1996-98), II: The Power of Identity, 2nd edn (2004). M.E. Porter and C.H.M. Ketels, “UK Competitiveness: Moving to the Next Stage,’’ DTI Economics Paper no. 3 (London: Department of Trade and Industry, May 2003). J.G. March, “Exploration and Exploitation in Organizational Learning,” Organization Science, 2 (1991), 71-87. R. Duncan, “The Ambidextrous Organization: Designing Dual Structures for Innovation,” in The Management of Organization Design, ed. by R.H. Kilmann et al. (New York: North-Holland, 1976), 167-188. M.L. Tushman and C.A. O’Reilly, “The Ambidextrous Organization: Managing Evolutionary and Revolutionary Change,” California Management Review, 38 (1996), 8-30. C.E. Helfat et al., Dynamic Capabilities: Understanding Strategic Change in Organizations (Malden, Mass. : Blackwell, 2007). A. Osterwalder et al., “Clarifying Business Models: Origins, Present and Future of the Concept,” Communications of the Association for Information Systems, 16 (2005), 751-75. C. De Anca, Beyond Tribalism: Managing Identities in a Diverse World (Basingstoke: Palgrave Macmillan, 2012), 99. Shari’a means Islamic law. Islamic banks normally have a division of experts of Islamic law and a related board of Islamic scholars who decide on the conformity of the financial products to the Islamic law principles. Source: personal interview with Juan Perpignan, CEO Quavitam. Aragón, Salvador and De Anca, Celia. “Diversity and Tribal Thinking in the Collaborative Organization.” In Reinventing the Company in the Digital Age. Madrid: BBVA, 2014.